I partially solved the problem. You don't insert them as new lines. As per the instructions, you add them both to the end of the linux line. Start your system and wait for the GRUB menu to show (if you don't see a GRUB menu, press and hold the left Shift key right after starting the system). Go down to the line starting with linux and add your parameter foo=bar to its end. Do you know how to add then try these two kernel boot parameters ? once that finishes, reboot to test .. does the keyboard/touchpad work now ? I reinstalled, again the it works until I shut down the notebook. In matter, I shutdown the notebook with keyboard working and when I turn on it stops working. I am running without installation and keyboard is working aggain. I will reinstall peppermint and see what change, what i could post before I reinstal for compare later ? Are you sure there's not a switch somewhere that disables them ? Does the keyboard/mouse work if you log into the Guest session ? 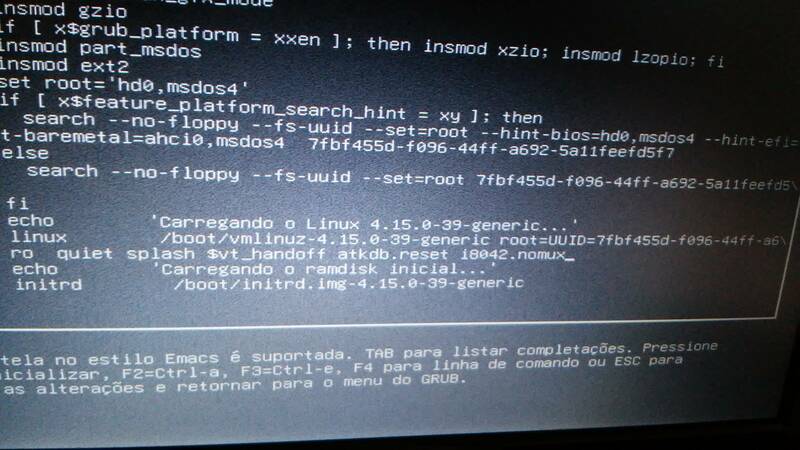 Do they work if you boot a liveUSB ? And are you saying they stopped working BEFORE you installed ANY updates ? Also, have you recently updated you system? 1 - I installed the Peppermint 9, all ok.
2 - I used Firefox and I shut down the notebook hours later. This will give us some detailed information about you system. Also, have you recently updated you system?